This article first appeared in The Khaama Press News Agency and we republished it in our blog section. 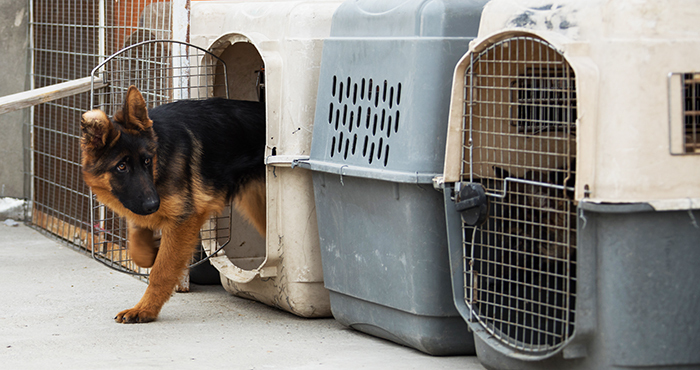 Afghanistan German Shepherd Dogs Club based in Kabul is the only dog shop in Afghanistan. The club established in January 2018 provides healthcare, food and accessories, training and dog selling services in Kabul. It is yet the only dog shop in the country that have been licensed by the Ministry of Commerce and Industries. According to reports, a small population of Afghanistan keeps dogs in the cities, but a large number of them in rural areas and villages keep guard dogs to prevent strangers entering their properties. Massoud Sinan, the sales manager at the shop says that he gets new customers every day. Most people who keeps dog at homes, they do not have primary knowledge of feeding and vaccination, but we brief them here about healthcare and dog foods, said Massoud. He further added that most people don’t know that homemade foods are not healthy for the dogs. There are certain foods that are harmful for the dogs’ health, he added. This local pet shop enters into business deals with private and public organizations who keep security and K9 dogs as well. “We provide dog foods and healthcare services to several de-mining and security companies. Previously, the companies had to directly import dog foods or some de-mining companies used to bring dog food in large number and resell it on other companies for higher price, but now we are here to provide whatever they require,” said Massoud. Mohammad Firoz Mohammadi works as the senior vet. He manages the clinic with another two female vets. Individuals and families keeping pets must first care about the healthcare and cleanliness, said Dr. Firoz. “We are a one-stop shop that provides anything a dog keeper needs. We supply and sell 8 to 30 months old puppies, mostly German Shepherd breeds that has very high demand in Afghanistan. In addition, we do vaccination, deworming, surgeries and grooming,” Firoz said. The company has attracted considerable attention in social media over a relatively short span of time and currently has more than 100,000 followers in Facebook. The products available in the store for the dogs, include Royal Canin, Dr. Clauder’s, Brit, Reflex, and Farmina, according to the company owners.